BelarusDigest > All > How can Brussels Help the Union of Poles? Gone is the time when Belarusians were one of the smaller ethnic groups in the Polish-Lithuanian Commonwealth. And it is clear that the decades of Soviet rule made Belarus lose the traits that the Rech Pospolita was so famous for: ethnic diversity, religious tolerance, and democratic attributes of political system. A brief thaw in the Belarusian-Polish relations came to an end once the Belarusian authorities cracked down on the Union of Poles in Belarus. Forty ethnic Poles as Belarus have been arrested, some sentenced to five-day jail terms, and Andzelika Borys, the leader of the Union of Poles, was fined for $360. On February 17, the Belarusian court ruled that the Union’s headquarters must be turned over to a pro-Minsk Polish group that is not recognized by Warsaw. In short, the Union of Poles has suffered the fate of a typical Belarusian NGO. Polish President Lech Kaczynski and Foreign Minister Radoslaw Sikorski, who had in the past led the European effort to improve relations with Belarus, both chastised Minsk over its boorish behavior with regard to ethnic minorities. EU Parliament President Jerzy Buzek, a Pole, also called on Minsk to mind its manners when dealing with NGOs. Even the EU’s foreign representative Catherine Ashton joined in and warned that Belarus’ place in the Eastern Partnership will be jepardized if Minsk persists in violating minority rights. She said she was very “disappointed.” Unfortunately, Ashton’s “disappointment” will hardly make to Belarusian leadership lose sleep. Neither will it help the Belarusian Poles and other civil-society groups in Belarus sleep better and feel safer. In the unequal match between the Union of Poles in Belarus and the Russia-Belarus Union state it is clear who will prevail. Of course, the Union of Poles has the entire EU on its side. But as long as Brussel’s continues to seek improvement in its relations with Minsk more than Minsk itself does, the EU’s support for human rights in Belarus will matter little. Reaching out to Belarus as it bites the offering hand is ineffective at best and counterproductive at worst. It will not take this hand in earnest unless it indeed needs to be rescued, as had happened for a brief period in the beginning of the global economic crisis when the opportunity was missed. Belarusian riot police has violently dispersed two peaceful opposition demonstrations in Minsk – on February, 14 and February, 16. 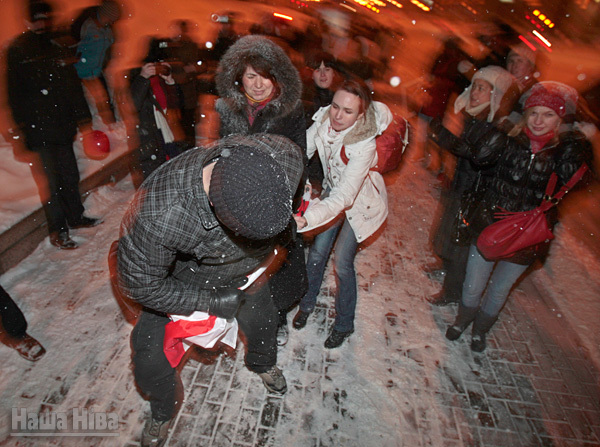 On February, 16 the police has beaten up a demonstration of solidarity of the Belarusian democratic opposition with the Union of Poles of Belarus. 28 people have been arrested including the well-known photographer Julija Daraškievič. See reports by RFE/RL, RFE/RL Belarusian Edition and Naša Niva. Belarusian analysts relate the increased violence of the police’s actions with the upcoming local elections and the presidential electoral campaign.